At the Discuss Manchester debate on education this week I was greatly encouraged by a conclusion to some of the bright, startling and inspirational ideas being chucked around. Devolution is a possibility - not an inevitability. A challenge, not a solution. All the speakers were fantastic - I could listen to Debra Kidd and Melissa Benn all day long. But as ever our audience rose to that challenge of thought leadership and ambition. 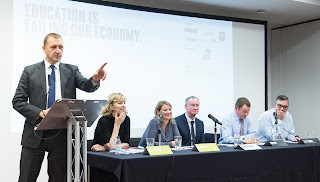 Overwhelmingly our audience agreed that education is failing our economy, despite a valiant and well-argued attempt to persuade us otherwise by Nick Bent and Alun Francis. The very deliberate word I asserted in that motion, by the way, was "our". Our solution to our problem. Well, let's create a Manchester curriculum, for starters. Since I raised it in the round table discussion with the PM, the Chancellor and other Northern leaders after George Osborne's Northern Powerhouse speech I've scratched my head as to why it hasn't formed a plank of the whole DevoManc edifice. Health and social care is arguably harder and riskier, while the direct benefits of education reform also potentially solve two problems in one - happiness and productivity. Mike Emmerich has written a very smart piece for the Guardian on how cities need to scale up their ambitions on devolution. And I've written a great deal including this, also for the Guardian, about how devolution presents a real opportunity to shape the future, whereas to most people it's still seen as something that is done to you by "they". I think a lot about "they". At a meeting in our local area on Tuesday I witnessed one of those transitions from "they" to "we". Matt Grant is one of those special people in any community who cares enough to do something and uses his skills and resources to lead. He'd be reluctant to call himself a "community leader" or "organiser" but in addressing some of the acute traffic problems he's shown a great deal more vision than our local councillors. Long story short, there's going to be a new by-pass that will link the A6 to the Airport road. It will inevitably change traffic patterns. We have a problem with speeding on local roads. Matt and the Windlehurst Living Streets Group (of which I'm a tiny part) have pushed and pushed through Freedom of Information (FOI) requests, meetings with officers and councillors for information about whether we have a problem (we do) and what are the solutions (inadequate). This week Matt presented the start of "our" alternative strategy. This is what devolution should be doing. Not just creating another structure slightly less far away that does stuff to you, but where decisions are taken at the appropriate level. Not just accepting what central government are doing but challenging it. Not just railing against an agreement because one side of it are Tories, who are very good at devolving other people's power, but seizing the moment because it has the possibility of better outcomes. In another meeting I was at this week with a client we had a presentation on how HMRC are tackling the tax gap. Shortly after we hear that they are to be regionalised and rationalised, resulting in job losses and disruption to service. My old colleagues at the Institute of Chartered Accountants (ICAEW) are rightly sceptical about this. But what if it was a tax collection and incentive service that operated locally according to the priorities of an area? One again, the possibilities start to light up the imagination. Finally, in the course of challenging ideas and exploring new areas of interest about how we work I attended a session on Tuesday about entrepreneurial wellbeing. I saw a terrific presentation by Kat Taylor on bipolar disorders and creative people. It was unsettling at times, but inspiring about how we must celebrate and embrace difference and diversity, however hard that can be. So, an incredibly exciting, challenging and inspiring week - I'd like to think I can loll about on Saturday and think this through a bit more, but I'm up at the crack of dawn to review the newspapers with Andy Crane on BBC Radio Manchester. Maybe some of this will make it onto the programme.